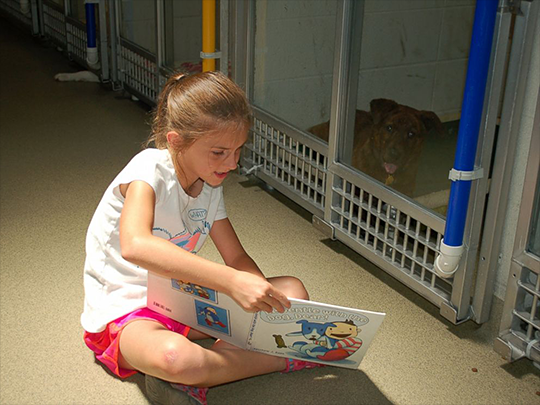 Children can practice their reading and help timid shelter dogs learn to socialize in a new mutually beneficial program at the Humane Society of Missouri. 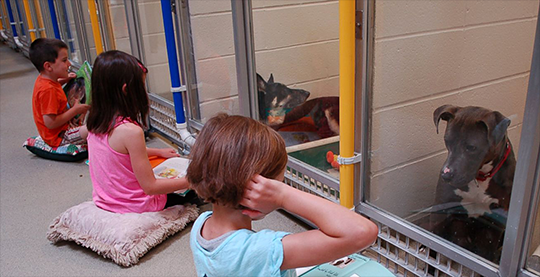 In the Shelter Buddies Reading Program, kids can read to a completely non-judgmental audience and also help acclimatize often timid or anxious shelter dogs to the presence of humans. "We started this for two reasons," JoEllyn Klepacki, the assistant director of education at the Missouri Humane Society, told ABC News today. "Dogs in a shelter environment exhibit a lot of signs of anxiety and show stress signals, so we wanted to do something to comfort them, and we have a lot of children in our area who are really engaged and they ask, 'How can I help? How can I make a difference?'" The kids, ages 6 through 15, go through a training program that teaches them to understand the perspective of dogs in a shelter environment and how to read the dogs' body language. 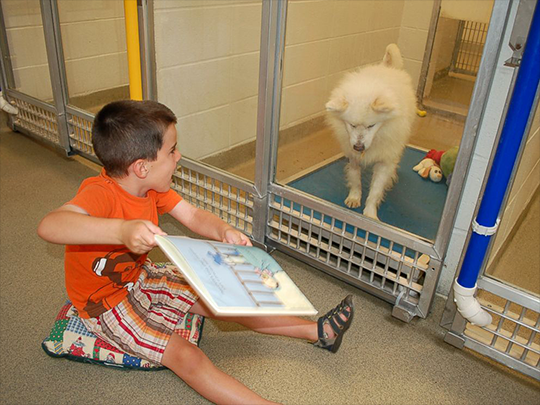 Children can then bring their own books to read to the dogs or borrow from the shelter's extensive library of animal-related books. "These dogs, if you had seen them before the kids sat down, these were the dogs who would stay at the back of their kennel, scared," Klepacki told ABC News. "The goal is to get the dog to come to the front of the kennel by the time they finish their book, or a few books." She added: "We know that dogs that approach the kennel front get adopted more quickly, so they are helping these dogs get a home." The kids will also pass treats to the dogs if they come to the front of the kennel, positively reinforcing the behavior. Klepacki said the difference the program, which started in December, has made in the shelter is "just amazing."